Lead can be found in interior and exterior paints or in plumbing as lead pipes or lead solder on copper pipes. The presence or absence of lead in a building may have many implications. The value of a property may be greatly reduced due to the presence of lead. Dangers associated with lead dust from renovation and demolition activities in older buildings and the high costs for lead clean-up or removal by recognized professionals must be realized and passed on to your clients. Lead is now being placed in the same group as asbestos and urea formaldehyde with regards to reducing the value of a property. Lead, once identified, becomes a health hazard to contractors and a potential future liability for property owners and the architect responsible for the project. As a licensed and responsible professional you must be aware of and identify the presence or absence of these materials when dealing with building retrofits. Failure to advise your client(s) or contractors working on a project of the presence of hazardous materials in and/or on a property may present you with potential future liabilities. It is your obligation to protect the interests of your client(s), the health and safety of workers, and the natural environment. National Environmental Contracting will arrange an independent consultant for hazardous materials and other potential environmental concerns on residential, commercial and industrial properties. Each assessment includes sampling of all suspected hazardous materials, confirmatory laboratory analysis and complete reporting of all findings. We can also complete specifications and tender packages for any required remedial activities and perform project management services. All environmental consultants and environmental engineers are licensed, have errors and omissions insurance and pollution, asbestos and environmental coverage. National Environmental Contracting has extensive experience of Lead Cleanup that can be utilized on your Lead Project. Some of clients include: Northern Telecom, Mitsubishi Electronics, Canadian Tire Corporation etc. All work will conform to the Occupational Health & Safety Act. Prior to any work commencing, a number of swab samples must be taken from the areas to be cleaned. An independent consultant must select various locations in the cleanup area. Personnel - under the Occupational Health & Safety Act all personnel on site must be informed of the contaminants on site. No untrained persons will be allowed on the site once site remedial procedures have commenced. 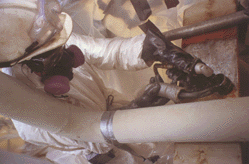 All personnel must be properly trained in Asbestos, WHMIS and Lead Abatement. Prior to cleanup, personnel will participate in a review of all contaminants found on the site, including training in proper handling, packaging, and preparation for disposal of Dust, Heany Metal, and/or Chemical contaminants on site. Positive Air Pressured Respirators will be used, and personnel will require Respirator fit testing off all respirators. All suits, gloves and eye protection equipment will be approved for use with contaminants on site. Training will cover procedures for decontamination, showering and cleansing of personnel and protective equipment. Personnel will also receive instruction in all necessary procedures to protect personal health of themselves and co-workers. If lead is contained in the swab samples, all personnel must have blood samples taken before starting and after completion of the project. A Decontamination Structure will be installed with change room, clean room, shower facilities, and dirty room. Hot and cold water will be made available. HEPA Negative Air Filtering Units will be installed at various locations in the area where dust cleaning procedures are being performed. HEPA Vacuums will only be used on site for the collection of dust contaminants from surface areas. Areas that are not included in this contract will be sealed off. Install decontamination structure so all personnel must enter and leave through air lock system. HEPA Vacuum ceilings, pipes, light fixtures, conduits, structural beams, I-beams, walls, ledges and floors. Remove surface contaminated dust that can or will become airborne. Remove and clean the air handling plastic ductwork for disposal. All Ventilation and Heating equipment (this is not included in our quotation) must be cleaned and serviced, all filters changed and handed over to us for disposal preparation and packaging. All surfaces of lights, windows, and heating equipment will be wet wiped and washed by hand. Contaminated water will be collected and saved for proper disposal. A light acid wash will be used to neutralize affected surfaces. HEPA Filters will be installed on all showers and water supply, to be changed daily. A very light water misting will be used during removal of surface dust for dust settling. An Encapsulant Latex Air Glue will be sprayed on surfaces throughout contaminated area, if required. All floors are covered with plastic. All surfaces which contain dirt or solid grease are sprayed only after surface dust has been removed. A cleanup and disinfection of the test area will be completed immediately after commencement. This area will have had two swab samples analyzed. All waste, contaminated dust, suits, rags and water will be placed in waste receptors to be collected for pickup by a licensed Environmental Transport/Hauler to an approved designated disposal site. A cleanup and disinfection of the test area will be completed immediately after commencement. This area will have had two swab samples analyzed. Disposal and pickup costs are not included in our quotation. Laidlaw and Republic are two haulers and disposal firms which are very competitive. The arrangements made for disposal and haulage as well as the preparation, packaging, bagging, and drum supply for the waste is included. Charts will give the parameters of the contaminants, the averages prior ro cleanup, after cleanup and percentage of cleanup efficiency. The area selected usually contains a very high level of contaminated dust. Only the minimum\ amount of water should be used. All water will be collected, and NO water will be discharged without the consent of consultant and prior testing and analysis, to ensure that it conforms with required sanitary sewage bylaws. The showers of the decontamination structure will have approved MOE and OSHA approved HEPA Filtering equipment. Only qualified personnel approved by consultant and/or contractor will have building access one the project commences. Anyone entering the building must have proof of Asbestos and WHMIS training program, and will require hard-toed boots, safety goggles, respirator training, and hard-hat. Power washing and steam cleaning are not recommended due to the possibility of water runoff and seepage into concrete, floors, ground water and water table, sewers, and possible ground soil contamination. National Environmental Contracting, Inc. (NEC) is an environmental remediation contractor serving the heavy commercial and industrial markets. We currently have active contractor licenses in the states of Kentucky, Indiana, Ohio, Illinois, Tennessee, Georgia, Alabama, North Carolina, West Virginia, Arkansas, and Louisiana.